The reuse sector has grown steadily in Ireland in recent years, providing employment opportunities and developing a market place where a range of items from business and community throughout the public and private sector can be traded and exchanged in creative and imaginative ways. These guides help to highlight best practice and identify opportunities that the reuse sector provides to help extend the useful economic life of many items. “Europe is moving from a take-make-dispose model to one where items are kept in use for longer to reduce and prevent waste. The guides we have launched today will encourage and enhance Ireland’s growing, evolving culture of reuse and help to support further research that identifies ways to extend the life cycle of many everyday household and business items which have better economic and environmental outcomes. The guidance will also have a key role in supporting national Circular Economy ambitions and EU commitments. 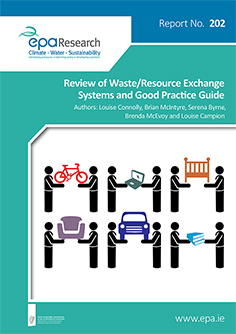 One of the reports, entitled ‘A Review of Waste/Resource Exchange Systems and Good Practice Guide’, aims to encourage exchange on a wider scale. It offers businesses and other interested parties practical advice about setting up and implementing a waste/resource exchange system, including best practice guidelines. 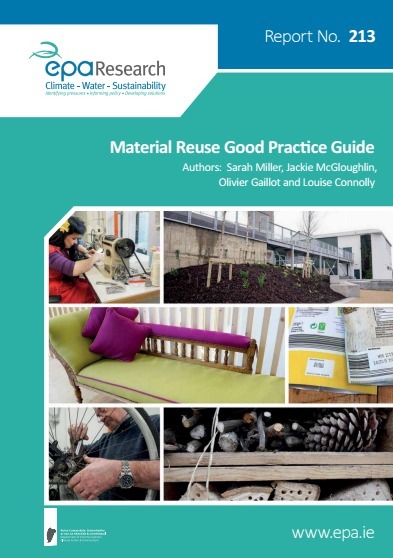 The other guide, ‘Material Reuse Good Practice’ provides householders with the information necessary to identify items that have potential for reuse and recycling rather than replacement. Members of the reuse community in Ireland contributed to the project by sharing their knowledge and experience via surveys and interviews and by participating in workshops. Links to research reports 202 and 213 are available on the EPA website. Growth in the Reuse sector offers benefits for economy, society and the environment. Reuse brings together two areas, namely reuse and waste management to find ways to extend the useful life of items and in so doing prevent waste that will need to be managed/disposed. Although Ireland’s recycling rate of 34% exceeds the EU28 average of 28%, there are opportunities to increase the level of Reuse to reduce the amount of waste going to overburdened landfills and the need for further resources to make more new products. Many reuse organisations are members of the Community Reuse Network of Ireland (CRNI), which is the all island representative body for community-based reuse, recycling and waste prevention. In 2015, CRNI suggested that their members diverted 39,000 tonnes of waste from landfill, allowing 24,000 tonnes to go into direct reuse. The EPA’s current Research Programme 2014–2020 is built around three pillars -Sustainability, Climate and Water. The Programme aims to identify pressures, inform policy and develop solutions. More information about the EPA Research Programme can be found by visiting the EPA Website where you can also sign up for the quarterly Research Newsletter. This provides news and updates about research calls, events and publications that are of relevance to researchers and other interested parties. You can also follow EPA Research on Twitter @eparesearchnews for the very latest information and developments about the Research Programme and its projects.